What happens when Sansa Stark and a Jonas Brother walk into an Oscars after-party? Great style and even better dance moves come shortly after. 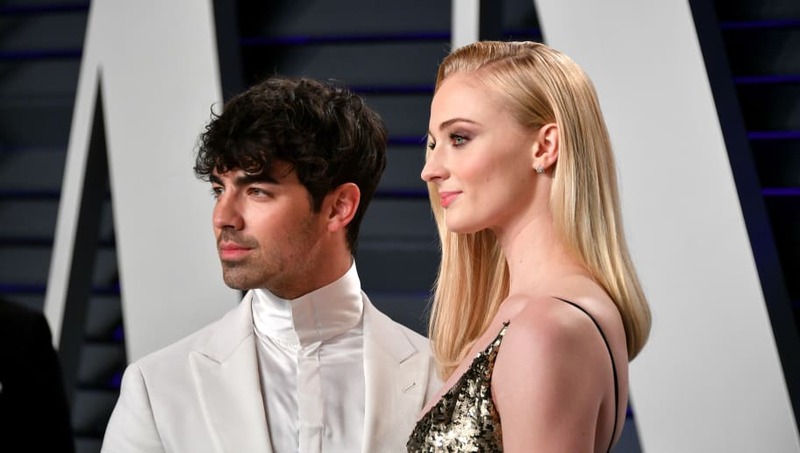 Game of Thrones actress Sophie Turner, 23, and DNCE singer Joe Jonas, 29, showed up to Vanity Fair's after-party following Sunday night's Academy Awards dressed to the nines, and gave eager fans a glimpse at their glamorous life together. The couple was filmed showing off their dance moves by friends at the event at the Wallis Annenberg Center for the Performing Arts in Beverly Hills. Turner was seen wearing a gorgeous black and gold Louis Vuitton gown with ruffle detailing, and added a matching clutch and sandals. Jonas emulated late pop sensation Prince when he sported a thick collared white silk shirt paired with a white jacket and pants. He also added detailed black loafers to break up the monochromatic look. The pair wasn't the only JoBro couple to make an appearance--younger brother Nick Jonas, 26, was also spotted at the Oscars with his wife, actress Priyanka Chopra, 36. Nick opted for a more traditional suit complimented nicely by a bowtie, while Chopra looked show-stopping in a deep v-neck black dress with a tulle skirt and silver embellishments. Although neither of the Jonas boys or their respective partners were nominated for a film, they all dressed to impress after the ceremony.